Drove US160 from Fort Garland to Walsenburg crossing LaVeta Pass, elevation 9413’. 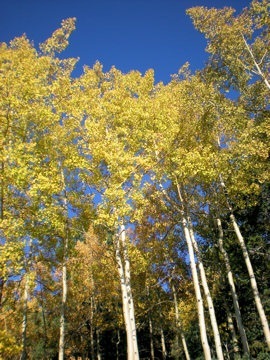 The aspen were gorgeous, as nice as we’ve seen this year. 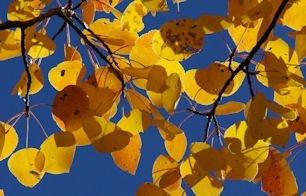 The yellows were bright and shimmering. While some groves had already dropped their leaves there were still some holdouts awaiting their change. Splashes of orange enhanced the stunning slopes. 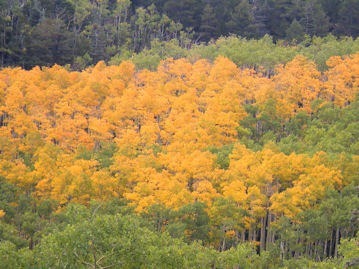 There was one glorious stand of orange aspen right along the road on the north side near the summit. We didn’t stop for pictures because the thickening clouds were only minutes from precipitation. 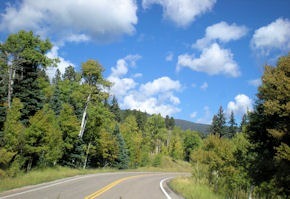 LaVeta Pass, properly known as North LaVeta Pass, is an easy drive over the Continental Divide in Southern Colorado. If you’re anywhere near the area in the next week check out the autumn color. Green predominates through Cimarron Canyon. 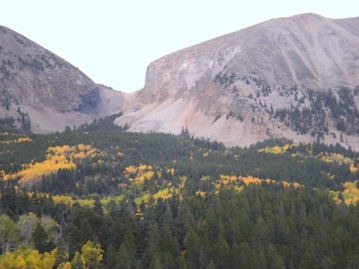 Views from Eagle Nest include splashes of colors on Wheeler Peak. 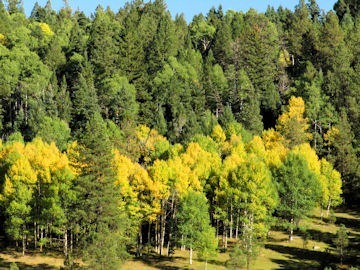 As soon as the road turns west from the Angel Fire intersection the promise of fall color increases. Twisting up Palo Flechado Pass many of the aspen are in transition, some green leaves edged with yellow. The peak is yet to come but scattered groves gleam golden or a lone tree absolutely glistens. Proceeding down Taos Canyon roadside color enhances with yellow-topped chamisa, silvery white dried seed heads, multi-hued grasses and red and orange shrubs against a background of dark green pines. 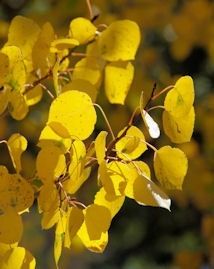 Further down the canyon willows and cottonwoods add a palette of yellow and gold. A number of artist studios along the route welcome visitors. Combine autumn and art for a engaging tour. Today we drove the 82-mile scenic byway from Walsenburg to Trinidad, Colorado via US160 and CO12 – the Highway of Legends. Very little fall color appeared until we reached Cuchara. 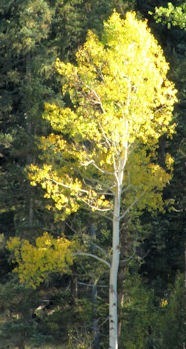 Along the ascent of 9,941’ Cucharas Pass, random aspen gave a preview of the coming golden glory. 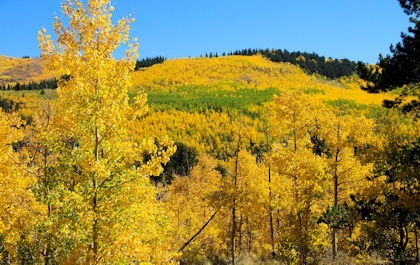 Across the valley, near the top of the pass, one grove gleamed in rich yellow/orange hues encircled by large stands of green aspen awaiting transformation. 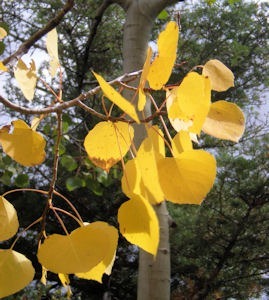 Aspen are prolific along the section of CO12 between Cuchara and Monument Park. Many hillsides support dense stands. The tall thin trunks seem to form a while fence across the slopes. 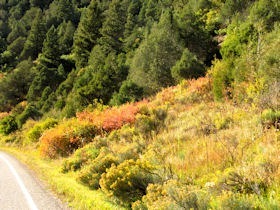 While color changes enhanced the scenic byway route today the best is yet to come along the Highway of Legends. I would guess that within a week to ten days the area will be at its peak seasonal display. Mountainsides of trembling gold, splashes of orange and red plus cloudless blue skies – a perfect Colorado September day. Hearing forecasts of the fall colors peaking early this year we headed to the hills in search of seasonal glory. We struck gold! We left Denver on US285 westbound. 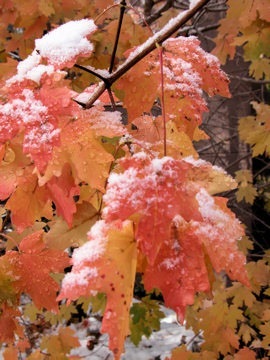 Just a sprinkling of color appeared until around Grant. 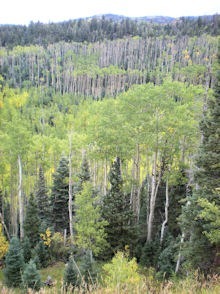 Kenosha Pass is heavily forested in aspen and they were truly at their peak – a mother lode of gold. We weren’t the only ones out looking for color; hikers, bikers, horseback riders and photographers jockeyed for preferred positions. The road descends into South Park. 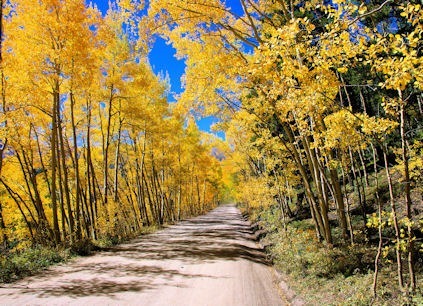 At Como we turn onto Boreas Pass Road – 21 miles to Breckenridge. Just outside of Como the pavement turns to gravel, a bit rough in spots but car drivable. The route follows the roadbed of the Denver South Park & Pacific Railroad constructed in 1880-81. When completed in 1884 the DSP&P was the shortest route between Denver and the rich Leadville mining district. Looking for photo opportunities we follow a narrow side road and soon find ourselves at the Como Cemetery. 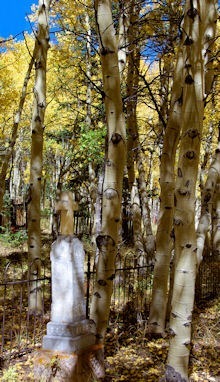 Dense aspen stands nearly hide many of the tombstones, some dating back to the 1870s. 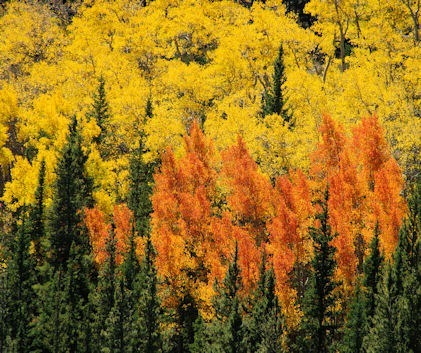 The east side of Boreas Pass supports many aspen groves, almost all of which have turned to shades of yellow, gold, orange, red, bronze or rust. Descending down the west side to Breckenridge we find fewer, but bright spectacular groves. Hoping to avoid Sunday afternoon I-70 traffic we follow CO9 over Hoosier Pass to Fairplay. At 11,542’ elevation the pass is too high to support aspen. However we don’t have to travel far down the south side before mountainsides on the left and right glisten in the afternoon sun. After a late lunch at the Brown Burro in Fairplay we head east on US285 over Red Hill and Kenosha Passes back to Denver. Temperatures in the mountains were comfortably in the 70s. Denver set a record at 96 degrees. Even at 5pm the sky was still cloudless; our Rocky Mountain day was truly golden. 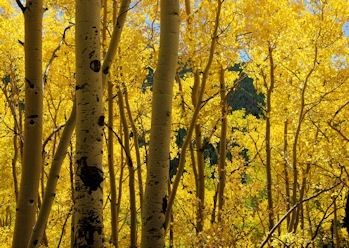 If you want to see aspen at their best in central Colorado make the trip soon before all that glitters drifts to earth. The route as describe over Kenosha Pass, Boreas Pass, Hoosier Pass, Red Hill Pass and returning over Kenosha Pass is approximately a 200-mile roundtrip from Denver. With lots of stops for photos plus exploring historic sites and cemeteries we made the trip in eight hours. After mountain road closures due to snow and ice, rain, chill and morning frost along Colorado’s Front Range the day dawned with crisp blue skies. A halo of clouds hugged the shoulders of Pikes Peak. A day too perfect to stay home and attend to chores. We headed southeast of Denver to Castlewood Canyon State Park outside of Franktown. The park straddles five different life zones from short grass prairie and caprock to coniferous forest and riparian. The mixed shrubland has begun its autumnal color transformation. We drove the unpaved road along the west side of the park from CO86 to Lake Gulch Road. 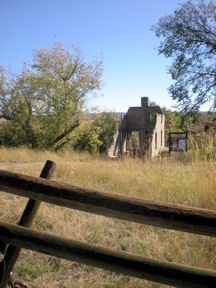 The route passes the Lucas Homestead Historic Site, the popular Westside Trailhead and the ruins of Castlewood Dam which burst in 1933 flooding downstream Denver with a 15-foot wall of water. 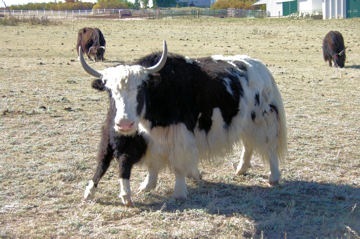 On our way out to CO87 we passed a yak farm. As Bob snapped a few pictures of the long-haired Asian bovines I noted the farm’s website – www.greeneggsandyak.com. We didn’t stop to purchase either yak or eggs but I did come home and visit their web pages. Now we’re intrigued and Bob’s ready to try yak. Avoiding Interstate travel we skirted Colorado Springs on the east and were amazed at the growth and development. Our next destination was one of Colorado’s newest state parks, Cheyenne Mountain, south of the city west of US115. A stop at the “crown jewel” Visitor Center gave us a bit of history and information on the facilities and trails. Twenty miles of joint use (hiking/biking) trails span terrain from grasslands to mountain slope pine forests. Campgrounds and picnic sites are nicely situated among scrub oak and mountain mahogany. Hungry tummies directed us to Conway’s Red Top, a Colorado Springs classic famous for their burgers filling a 6-inch bun. Never fear, you can order a half burger. We split a half cheeseburger and a half Senor Red Top with jalapeno and pepper jack cheese. Bob indulged with a cherry milk shake so thick the spoon was much more useful than the straw. We chose the pastoral, foothill horse country between Palmer Lake and Sedalia for our homebound journey. Peaceful and unhurried we happily left behind the aggression of I-25 traffic, soaking in mountain views bathed in autumn sunshine and color. Today’s journey took us to Cripple Creek, Colorado. More than a century ago Cripple Creek was the center of a rich mining district with a population of over 50,000. We went in search of history, spirits and autumn gold. Snow lines the road in shady alcoves, a testament to our interlude with winter in the past week. 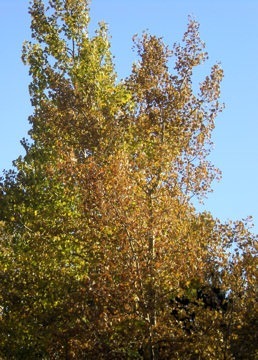 A bronze patina paints some of the aspen trees, hues seldom seen with aspen. 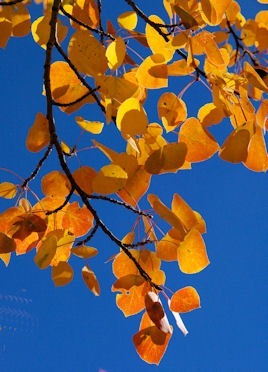 The sky stayed cloudless throughout the day, treating us to rich blue in distinctive contrast to yellow quaking leaves and white bark tree trunks. 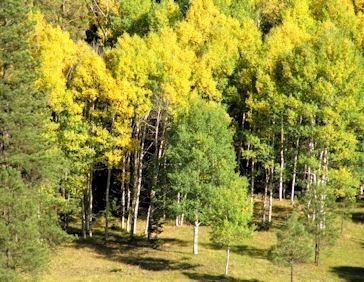 The 18-miles between Divide and Cripple Creek is blessed with large numbers of aspen. With the west shoulders of Pikes Peak rising to the east visitors find the drive scenic any time of year but truly outstanding during peak color season. 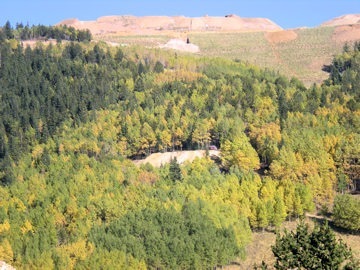 We saw some very nice color today but the region has a lot of green still to make the transformation to gold. The best color around Cripple Creek is yet to come. As summer turned to fall Colorado experienced schizophrenic weather this week. The last full day of summer gave us chill temps and enough snow in some locales to call out the snow plows. Photos from Winter Park show the peaks and ski slopes fully covered in white. Is that to be the color of the season? I’m sure some enthusiasts are tuning and polishing their skis this weekend. The forecast for Saturday shows temperatures predicted to equal August averages. We can only take it one day – no, one hour at a time. 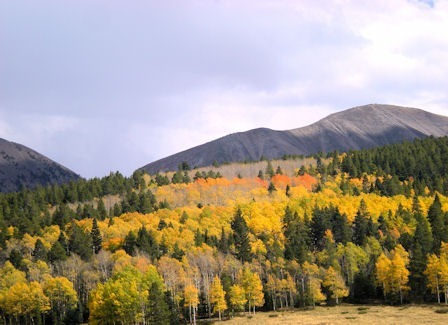 Hopefully we’ll join others this weekend reveling in sunshine and warmth for a day trip to check out how the changing aspens withstood the week. Come back tomorrow night for an updated report.